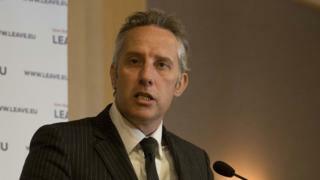 A council broke its own rules when it paid for officials to attend a dinner hosted by DUP MP Ian Paisley, the Audit Office has found. Mid and East Antrim Borough Council (MEABC) had a spending limit of £500, but paid £1,500 for a table for 10 at the event. The Audit Office said the council did not assess its attendance at the event in line with this policy. The payments are being investigated by the Electoral Commission. The dinner, at the Tullyglass hotel in Ballymena, was attended by the then UK Agriculture Minister, Michael Gove, in September 2017. In reply to the Audit office comments, the council has proposed a new policy on attendance at events, which do not specify spending limits. These proposals have been criticised by some councillors. Sinn Féin councillor Patrice Hardy told the BBC any breach of rules would be "a very serious matter". He added: "It seems incredible that a new policy is now being proposed that would not have any spending limit in place. That is something I will certainly be opposing when it comes before full council," she said. TUV leader Jim Allister said ratepayers would be angered by the news of the breach of council policy. "The way in which this matter was handled - both in keeping councillors in the dark and smashing its own ceiling for spending ratepayers money on gala events - will trouble people across Mid and East Antrim, " the North Antrim MLA said. Speaking to the Irish News, SDLP councillor Declan O'Loan described the proposed policy changes as "very dangerous", while UUP councillor Stephen Nicholl said he had no doubt that councillors were now "aware of the openness and transparency that proper governance of public funds demands". A council spokesperson said with regard to the policy proposals: "As with any expenditure, decisions taken under this policy, if ratified, will be subject to extensive and fully auditable scrutiny, both internally and externally." The Audit Office document, prepared for MEABC, said council chief executive Anne Donaghy initially received a verbal invitation from Mr Paisley in early August 2017. A meeting of the council was informed that the MP had secured a meeting with Mr Gove. Ms Donaghy received the formal invitation on 5 September, after the monthly council meeting. This explained that the event was Mr Paisley's "annual constituency dinner" and would cost £1,500 for a table of 10. The Electoral Commission's investigation is focusing on the £1,500, which it described as a "donation" to Mr Paisley. Under commission rules, councils are not considered "permissible donors", and money from such bodies must be returned.